Ramen Adventures: Osaka Ramen School! We are holding a special class in collaboration with the Osaka Ramen School in Mitaka, Tokyo in April. Don't miss your chance! Please email me at ramenamerican@gmail.com if you are interested in a class. And if you could put "Osaka Ramen School" in the subject line, that would be great! 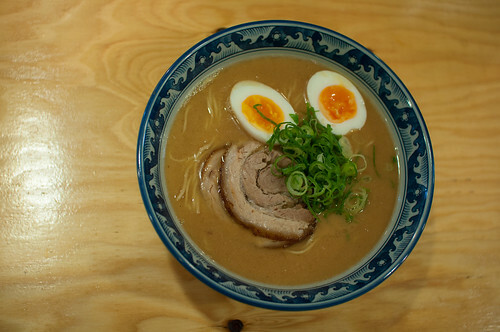 A 1-day crash course in all things ramen! How would you like to learn to make the above ramen; a creamy pork soup with handmade noodles and handmade toppings. The only thing not made from scratch was the bowl! 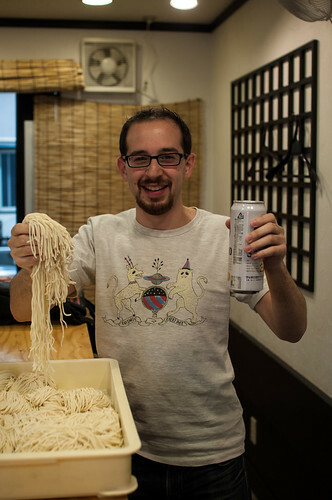 Ramen Adventures has teamed up with Osaka-based ramen school Toranoana to bring you a 1-day intensive ramen course designed for small groups of English speakers who want to enjoy a truly unique ramen experience in Japan. Your day starts at 9:00am in Nagase (長瀬). 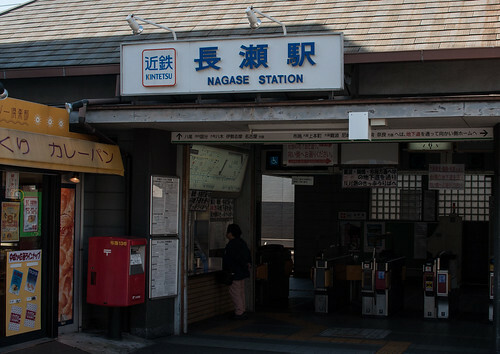 Nagase station is only about 15 minutes from downtown Osaka. Someone will meet you at the station. Note: Sometimes the class will start later, at around 2:00pm. I will let you know about any changes in the start time. 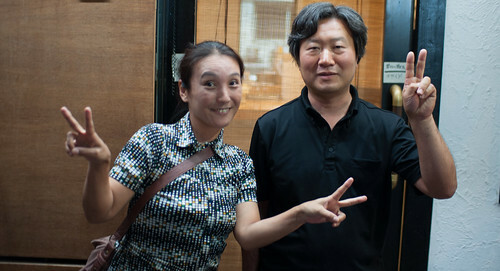 On the right is Miyajima-sensei and on the left is Ms. Asaoka, your translator. No Japanese? No problem! The school is located on the main road leading to Kinki University. 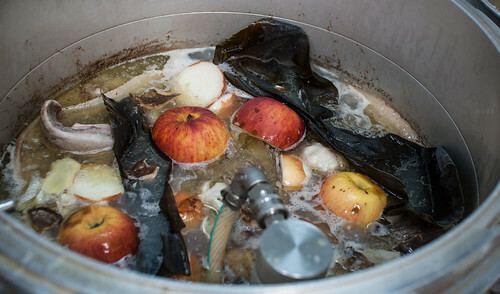 Spend a few hours prepping the soup. We'll be making two kinds of soup. 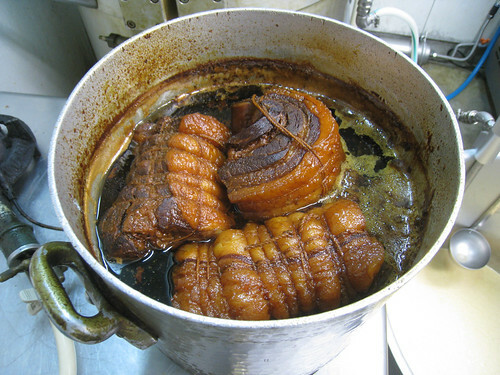 One is a simple clear broth and one is a a thicker creamy broth. 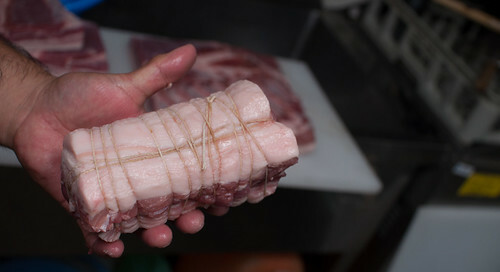 Once the soup is going, you'll learn all about chashu and making perfect eggs. It isn't all kitchen work! 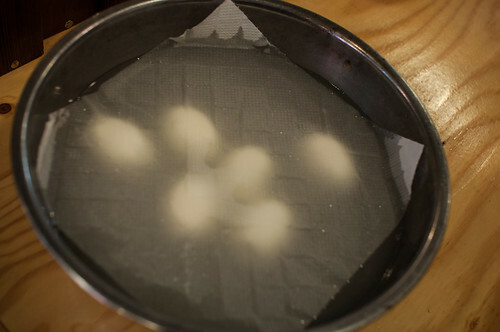 A crash course in ramen history and ramen culture is part of the curriculum. When lunch is over (ramen, of course) it's time to make the noodles. 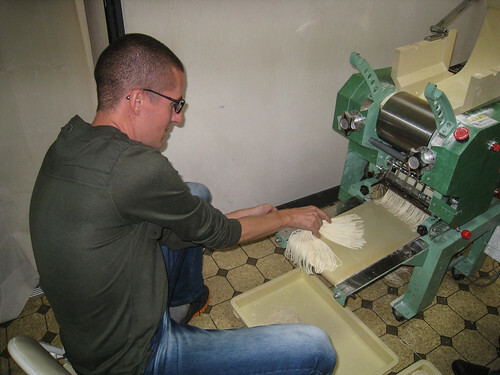 Talk about what makes the varied style of noodles before getting our hands covered in flour. Grab a beer from the local convenience store and celebrate. You just spent the day making your own bowl of ramen! The class is finished around 3pm. Please try and book as far in advance as you can. I have had to turn away many eager students because the school is booked a few months in advance. Where? Nagase, Osaka. I would suggest you stay in Kansai the night before. The station is very near both Osaka and Nara. When? There is no set schedule. Miyajima-sensei trains Japanese students regularly in long courses, sometimes more than two weeks. Please give as much notice as possible so we can try and coordinate. How Much? The cost for one or two students is $550 USD. This includes any service fees. The cost for three students is $650 USD. The cost for four students is $750 USD. Sign Up! Please mail me at ramenamerican@gmail.com with the days you would like to go. Please mention "Osaka Ramen School" in the subject. Q: Should I take notes? A: You are encouraged to take notes and ask as many questions as you need. Q: Why do you need my date of birth? A: We will give you a certificate of course completion, and this includes your date of birth. It is common in Japan for this sort of thing to have your birth date next to your name. Q: Will I be able to open and run a ramen shop after this course? A: You will have a knowledge of the ingredients needed to make ramen. Restaurant management is a whole other thing. Miyajima-sensei teaches much longer courses for people looking to open a shop. Please let me know if that is something you would be interested in. Q: Can I request a certain kind of ramen? A: Totally! 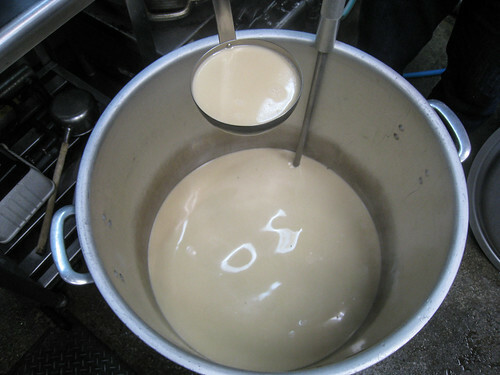 The standard we will make is a creamy soup and a clear soup, both made with chicken and pork bones. Specific styles are doable. Jiro-kei anyone? A: Kansai International Airport (KIX) is the closest. The school is less than an hour from the airport. Q: How do I get to Nagase Station? A: Nagase is on the Kintetsu Line. The best way is to take the local train from Tsuruhashi. Don't take the express train, it will send you flying past Nagase! A: I would suggest staying in a more central part of Osaka the night before. Namba has plenty of cheap hotels and a lot of good places to eat and sights to see. Also, you could easily stay in historic Nara. Nagase is only about 30 minutes from Nara. A: We require payment for the class in advance. We have a 1 month full refund policy. Over 14 days, we can't offer any refunds, but can try and reschedule the date if you need to change it. Within 14 days, we can not offer any refunds. Longer professional courses allow the teacher and student to really focus on bringing different ramen and tsukemen menu items to their shop. After discussing what sort of ingredients are most readily available, we can help make a custom menu that fits your needs. For these longer courses, you can stay at the teacher's extra apartment, free of charge. 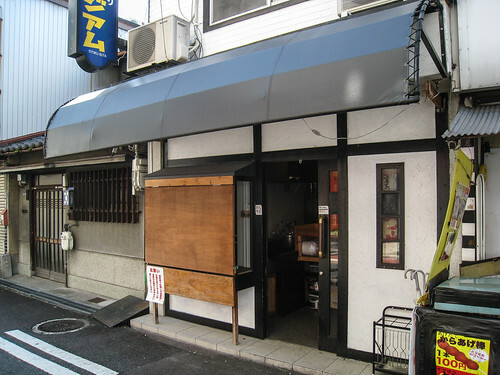 In the case that the apartment is unavailable, the school will book you into a guesthouse in Namba. These classes are 210,000 yen for 3-days, 315,000 yen for 5-days, and 480,00 yen for 7-days. There is a possibility you will be in a small group.